The Pitch: Photography: a window to the soul? The Review: The 20th century brought us cinema, the collective experience of watching moving images and sound projected onto a large screen. Creative minds have used this innovation to dazzle and to amaze with works of improbable fiction, but also to attempt to understand and document the human condition. This particular documentary looks at another form of documentation of the world, but by the use of a single frame rather than a collection of 24 per second. Donald McCullin has been at the forefront of his art for most of the fifty years he’s been pointing his camera at not always willing subjects, and Jacqui and David Morris’s documentary attempts to get to the heart both of what made his work so compelling, but also what drove someone to want to take such images, and to make a career out of it. The film consists predominantly of interviews with McCullin himself, including an extensive face-to-face interview where McCullin recounts his live story, interspersed with other clips of him being interviewed, including a Seventies interview on Michael Parkinson’s chat show. This recounting of his life story starts with his upbringing in and around east London where he first trained his camera on the other inhabitants, from the destitute to the more unsavoury. This soon got him work with the Observer newspaper, before eventually moving to the Sunday Times where he established his reputation as a supreme photojournalist. In the space of an eighteen year career, he covered many of the world’s major conflicts, from Cyprus to the Congo and Biafra, and from Vietnam to Northern Ireland, and his images sought to uncover the true nature and effects of those conflicts. Interspersed with the interviews are a selection of McCullin’s images from each period, and what immediately becomes clear is McCullin’s gift for being able to find the perfect moment within each shot. While we only ever see the choicest images from the reels of film taken, without his innate sense of composition and his flair for drama, he’d never be in a position to capture the powerful images shared with us on screen. McCullin looks at both sides of conflict, trying to understand what motivates men to keep fighting – although more interested in the effect than the cause, as witnessed by the image of the shell-shocked soldier seen in the photo above – but he also captured devastating images of suffering, often of children caught up unknowingly in these conflicts. His candour is refreshing but also allows for some alarming insights into how far he’s been willing to go in the name of his art, getting caught up with mercenaries and being shot at regularly enough for the occasional bullet to have found both him and his camera. If you’ve ever wondered how those taking such images manage to remain passive in the face of such suffering, then the documentary also makes it clear how this worked for Donald McCullin; it didn’t, and often a moving picture would have seen him interceding on behalf of his unfortunate subjects. Some of the images captured are by their very nature brutal, but thanks to McCullin’s need for compassion from the viewer they never feel exploitative, and taken as a whole they form a remarkable body of work of one man keen to expose the true horrors of this world and in some small way hope that the next generation sees this and tries not to repeat the mistakes. Two tiny quibbles: many of the conflicts (such as the Biafran secession from Nigeria in the late Sixties) are explained by means of black and white title cards which barely leave enough time to digest their contents, but this can be forgiven if you overlook them completely and focus on the content of the interviews and the selected photographs. As with any documentary, or indeed photograph, we are forced to accept an element of the truth portrayed to us, and certain occasional facts (such as the reasons why McCullin didn’t travel to the Falklands) may have other interpretations. This also results in a portrayal of McCullin almost as seen through his own eyes, but when they work as well as Donald McCullin’s do, that can be no bad thing. Why see it at the cinema: Compelling black and white photography, blown up to the size of a cinema screen, is just one reason to catch this in a cinema if you get the chance. What about the rating? Rated 15 for strong images of injury and real death. There are some image of death I wouldn’t say were out of place in a horror movie, but the black and white photography softens the blow somewhat. But that rating is spot on in my book. My cinema experience: Arrived at the Cambridge Arts Picturehouse cinema exactly on the advertised start time, which normally allows me to grab my ticket while the adverts are still playing. I’d reckoned without the immense queues for Les Mis, which had caused all three performances to sell out for Saturday. Thankfully you can pick up tickets at the bar, so I took the chance to grab a hot chocolate and my ticket together. The weight of numbers was even causing the coffee machine to groan under the strain, but it just about gurgled me out enough hot milk for a hot chocolate. Screening was half full, pretty impressive for a Saturday lunchtime doc screening, although that may have had to do with the limited number of screening opportunities during the week. Apart from one pair of noisy latecomers, a very civilised audience. The Corridor Of Uncertainty: Around 15 minutes. Thanks to the queues I arrived around the time of the BBFC title card, so missed the trailers this time round. 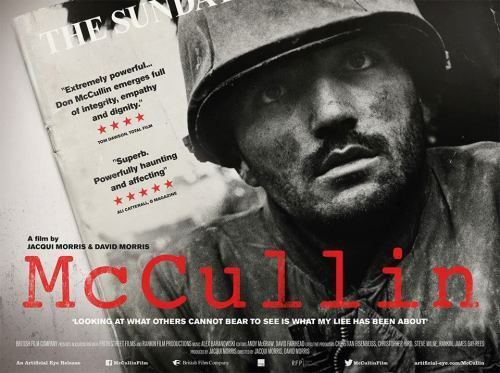 This entry was posted in Reviews and tagged 2013, documentary, Don McCullin, film, journalism, McCullin, movie, photography, review.